Gen Z has gotten a bad rap. Yes – their faces may be glued to their smartphones, but don’t mistake that for a disinterest in what’s happening in the world around them. This generation is a force to be reckoned with – using their digital devices to spread social and environmental messages far and wide. But they’re not going it alone – they expect companies to be their partners in change. Companies: it’s time to enlist Gen Z to share your CSR message. 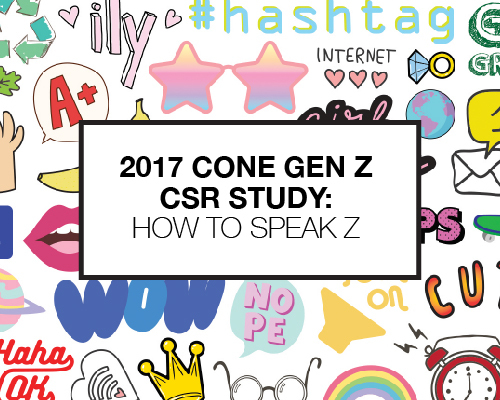 Join Cone Communications to learn about the findings and insights from the newly released 2017 Cone Gen Z CSR Study: How to Speak Z. This first of its kind study examines not only Gen Z’s attitudes and perceptions around CSR, but also how they’re willing to get involved for positive change. This webinar will walk you through key data and critical implications for business, as well as best practices and examples of companies effectively engaging this budding generation. The complimentary webinar presentation of the 2017 Cone Gen Z CSR Study: How to Speak Z is on October 4, from 1:00-2:00 p.m. ET. Please click here to register.